Terre Exotique trappers mix is made from salt and crystals of maple sugar obtained by evaporating maple syrup at 123°C. 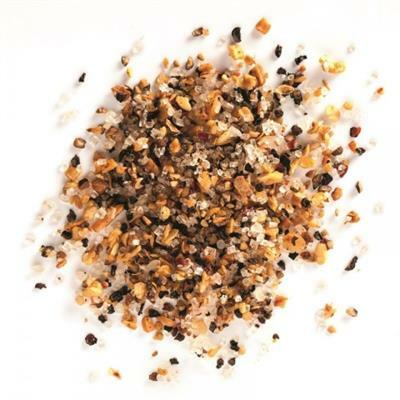 The blend is completely natural and also contains ingredients such as onion, garlic, red pepper, pepper and coriander. It is delicious with salmon, grilled meat, soups, and can be used before or after cooking like 'Fleur de sel'. Trappers mix was created by mistake, when a trapper from Northern Canada spilt some salt in his pot of maple syrup and seasoned his dried bison meat with it.